Visit our hotel: everyone can enjoy the Conero! Castelfidardo is strategically located in the province of Ancona is a heaven of peace and tranquility. Just 8km from the beautiful beaches of the Conero Coast and surrounded by picturesque Marche's cities like Loreto, Recanati and Macerata. Castelfidardo is the ideal destination for those who want a vacation of 360 degree. It is known as the birthplace of the accordion (In 800, Paolo Soprani, who was a local craftsman, has developed the prototype) and boasts about a unique museum in Italy: button accordions, accordions and other free reed instruments are the testimony of an industry that has made Castelfidardo one of the Leading Accordion Production Centers of the world. In our city, also it took place the famous Battle of Castelfidardo, in which the armies of the Kingdom of Sardinia fought against one of the Papal States, it was a decisive episode in the struggle for Italian Risorgimento, as a result of which it was possible to proclaim the birth of the kingdom of Italy. As evidence of the battle, on the occasion of the fiftieth anniversary a national monument was erected on the top of a hill and surrounded by a park of evergreen trees. It is surrounded by an artistic fence and it is definitely one of the places not to miss if you are around. The Hotel Parco is perfect for groups on holiday at Conero, suggests many clues how to avoid being bored and leads to ideas for new activities like visiting Calstelfidardo, sunbathing on the beach, going on an excursion, enjoying nature or discovering the art and culture ... we are sure that your holiday in the Conero Riviera will be unforgettable! 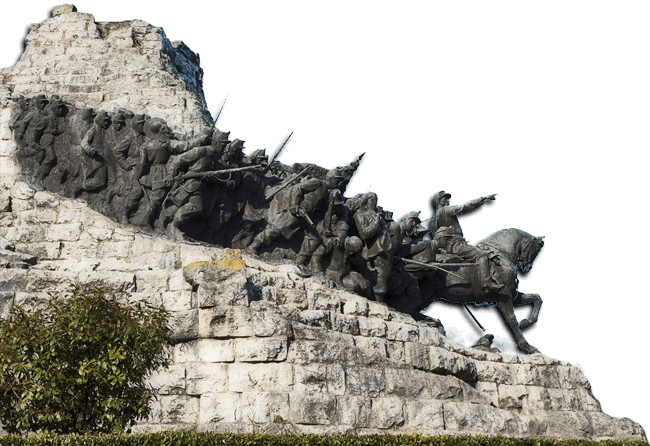 National Monument is located near the old town on the hill of Monte Cucco, it was made of bronze lost wax casting to commemorate the fiftieth anniversary of the battle on September 18th, 1860. The contest for its construction was won by the Venetian sculptor Vito Pardo, who proposed an innovative form of sculpture, a way of understanding the space, that has been defined as cinematographic, consists of choosing to put the riding leader on the same floor of the soldiers. Vito Pardo made his work as an allegory of the path suffered from the Unification of Italy: from a formless mass divided by the suffering was born one nation and one people. The Museum is located in the basement of the town hall in evocative seventeenth century, recently expanded, dedicated to the musical instrument that has been had in the town of Castelfidardo for over a century. This largest production center contains about 350 different specimens, many of them are "unique" and come from twenty-two different countries, accompanied by a traditional workshop of the last century. On the walls there is a very interesting photographic documentation from 1890 to 1970, paintings and other curiosities. You can also find there the largest functioning accordion of the world(2.53 m high for about 200 kg!). The Forest of Castelfidardo is located in Monte Oro. It is a unique natural heritage in Europe and characterized by a warm and dry microclimate in the summit area, cooler and less humid in the area with its biological diversity. The Forest is the surrounding area. In the past, it was the scene of the battle between Piedmont and the Papal on September 18th, 1860; Today, it is floristic protected area. You can visit the forest along paths where the "middle way" is the main road by a carriage passing, that stands out. Paolo Soprani was from a humble family of Castelfidardo. After meeting with a pilgrim to the Holy House of Loreto, that the young man has known the accordion. After having procured an instrument, the young Paul, intrigued by its operation, took it apart and then recoveried it in order to learn the process. And it then starts, in the basement of the house and along with his brothers, an own production of accordions was born, that started selling in the markets of the neighboring cities and gradually delevoped a production destined to grow with time taking the shape of the most popular and well known companies in Castelfidardo and in the world. Soprani Palace is located along the Matteotti avenue that connects the beautiful gardens of Porta Marina (a real balcony over the Adriatic) to the park entrance of the National Monument of Marche, the mighty and classical mass of the Soprani building makes it one of the largest private buildings and most representative in Castelfidardo. The Conero Riviera is famous for its beautiful beaches and its coves are characterized by unique scenery thanks to the natural setting of the Monte Conero. The most beautiful places, to enjoy at the beach, are definitely Numana and Sirolo. Numana is perfect for families and the beach lovers will find a comfortable shoreline of fine gravel and clean water. Sirolo and its overlooking the sea coves, will amaze everyone with its pristine beaches and breathtaking natural scenery. Conero Park ia a unique natural oasis, identifies the entire protected area surrounding Mount Conero and it is the perfect place for nature lovers! The 18 trails of varying difficulty and passable on foot, horseback or mountain bike, let you be actively involved in the park staying in close contact with the characteristic nature. Along the trails, from special viewpoints you can admire the unique sight of the Conero Coast with wonderful views and overlooking the sea cliffs. Practise sport on the beaches or in the Park; The particular shape of the territory and the presence of equipped structures allow guests of the Riviera to experience different kinds of sports, starting from classic up (in this way you cannot give up your form and keep fit during vacation) to the most special and adventurous ones. Choose your sport: Do you prefer the cool and lush vegetation of the Conero Park or the beach where you can have fun in the water? It's situated on a high hill overlooking the valleys of the Musone and dell'Aspio, about 20 kilometers from Ancona and 10 kilometers from the Conero Riviera, thanks to its favorable geographical position, Osimo is eligible for the most part of the year in a favorable atmosphere and magnificent panoramic views. Loreto is famous for the Sanctuary of the Holy House (where Jesus lived in Nazareth) and according to a medieval tradition, it was miraculously shifted here in 1294. The city is located on a hill, between the valleys of the rivers Potenza and Musone and it is one of the major pilgrimage destinations in the world. Macerata was born from the ashes of the Roman colony HELVIA RECINA; but today it's charming university town famous for its monuments, churches and the famous Sferisterio Arena where from May to September are held the greatest operas. Recanati was elected as the "city of poetry and culture". It's the birthplace of the poet Giacomo Leopardi and the tenor Beniamino Gigli. Today it is the destination of many students and fans of music and poetry. Ancona is the regional capital of the province. It was an ancient Roman port and it is still today the main hub for Greece, Croatia, Montenegro, Albania. The most beautiful among monuments there are: the 'Arch of Trajan and the Cathedral of San Ciriaco. Frasassi is perhaps the largest and most impressive cave system in Italy. Visit the baths of San Vittore, the Sanctuary of the Madonna of Frasassi, the Frasassi Gorge, carved by river Sentino.